This post is written by Maggie Mecklenborg, membership services coordinator for Experience Columbus. You can follow her on Twitter @MaggieMeck. I can hear the bells. It’s wedding season everyone! And you know what that means, bachelorette parties galore! Here are some Columbus-inspired bachelorette party game plans that will please everyone in the group and most importantly cater to the bride-to-be’s personality. If you are looking for a wild night out with your best ladies this itinerary is for you. Set the mood by heading over to Studio Rouge to learn some new dance moves- and not just any dance moves! Studio Rouge offers a variety of dance parties such as: exotic, burlesque, pole and lap dancing. You and your girl friends will be talking about this experience for years to come, and by the end of the class you will have some choreography to take home and practice! Another great activity that you and your friends have to try is the Pedal Wagon Tour. Who wouldn’t want to go on a pedal-powered bar hop in the Short North Arts District? After you work up a sweat, it’s time to get a bite to eat. If you plan to stay in the Short North check out Hubbard Grille or Forno Kitchen & Bar. Both of these Short North restaurants have private space and can accommodate a larger group of people. Tip: Make sure to try Forno’s Spiked Strawberries – they are a hit! Other great restaurants to continue the party at are Tequila Cowboy and Hofbräuhaus Columbus. Your friends will have a blast swaying side to side (or dancing on the tables) to authentic German music with a liter Hefeweizen in hand. Or taking a ride on “Tornado”, Tequila Cowboy’s resident mechanical bull, and singing your heart out to your favorite country song during karaoke! If you want to party on into the wee hours of the night check out Callahan’s or The Big Bang. The Big Bang is a great spot for drinks and to listen to live music and dueling pianos. The rooftop at Callahan’s has a VIP section and dance floor, and not to mention a beautiful view of the Columbus skyline! 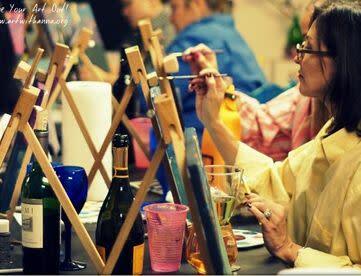 Uncork your inner artist at Art with Anna’s Wine Your Art Out Party! Anna offers different kinds of art classes and private parties where you can paint on canvases, wine glasses or even make a marquee sign. Art with Anna also offers mobile parties where they can come to you. Sounds like a plan- now all you need is some wine to get the creativity flowing! Speaking of wine, Camelot Cellars offers wine tastings and an “Adopt a Wine” program. Just sample and select from Camelot Cellars wine list, then skip the handcrafting process (which takes 6 – 12 weeks) and go straight to bottling, corking, capping and labeling your wine. Don’t just go to any restaurant for dinner – why not try a participatory dining experience? The Kitchen located in German Village puts you in a commercial cooking environment with professional tools with the finest seasonal ingredients. Their team will guide you through every step of creating your delicious meal. And last but not least is the sophisticated bride that just wants to be pampered and have a luxurious experience! 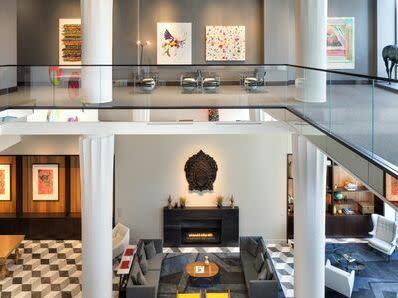 If this “type” of bride sounds like you then I recommend booking a hotel room or suite at one of Columbus’ boutique hotels, Le Meridien Columbus, The Joseph or The Lofts Hotel. Get the night started by hosting the ultimate, hands on mixology demonstration party right in your room! Your guests get to pour, muddle, shake and stir their own drinks with instruction from the Top Shelf Mixologist. After you check in, take a walk down into the Short North Arts District and shop at the local boutiques and art galleries. Make sure to stop by Mukha Spa. You can create your own custom lipstick while sipping on champagne, or have their experts take away the stress as you witness the art of applying a new you. Or, have a private bachelorette party at The W Nail Bar. This high-end mani and pedi bar has an impeccable luxurious setting that begs relaxation. Once you are all preened up enjoy a fine selection of seafood steak and sushi at Black Point. Reserve one of their stunning all glass private rooms. They have a great selection of wines, and you must try their Kings Tail Roll (my personal favorite). 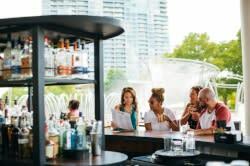 If you are looking for South Beach ambiance check out M. The restaurant offers a beautiful view of Downtown Columbus while serving phenomenal Pacific Rim and Europe inspired dishes. They also have an outdoor terrace overlooking the Scioto riverfront.